Location: Sheriff Hutton, North Yorkshire, England. 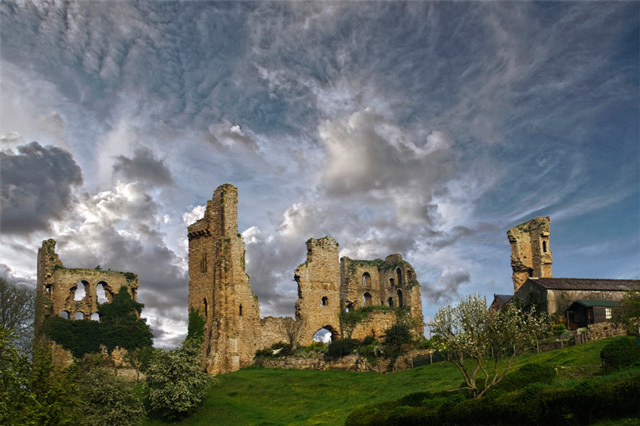 Notes: Sheriff Hutton Castle is a quadrangular castle in the village of Sheriff Hutton, North Yorkshire, England. The castle is quadrangular in form, with four rectangular corner towers connected by ranges of buildings, enclosing an inner courtyard. The northern and western sides are straight, whereas those on the south and east contain obtuse, outward pointing angles at their centres. The entrance lies in the east wall, protected by a gatehouse. Only sections of the towers stand to their original height, and the ranges of buildings and curtain walls between have now largely gone. A middle and outer ward originally existed, but these are now covered by the adjacent farm. The castles is a Grade II listed building, and recognised as an internationally important structure.